This blog post is the second in a series covering MongoDB PIT backups. You can find the first part here. The first blog post in this series looked at MongoDB backups in a simple single-replica set environment. In this post, we’ll look at the scale-out use case. When sharding, we have exactly the same problem as we do on a single replica set. However, now the problem is multiplied by the number of replica sets in the cluster. Additionally, we have a bonus problem: each replica set has unique data. 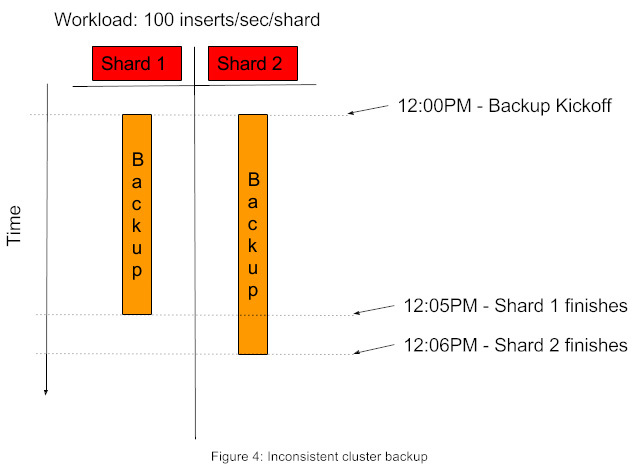 That means to get a truly consistent snapshot of the cluster, we need to orchestrate our backups to capture a single consistent point in time. Just so we’re on the same page, that means that every replica set needs to stop their backups at, or near, the same time that the slowest replica set stops. Are you sufficiently confused now? Let me get to a basic concept that I forgot to cover in the first post, and then I’ll give you a simple description of the problem. So far, I’ve neglected to talk about the very important role of “write concern” when taking consistent backups. In MongoDB, the database is not durable by default. By “durable,” I mean “on disk” when the database acknowledges receipt of an operation from your application. There are most likely several reasons for this. Most likely the biggest one originally was probably throughput given a lack of concurrency. However, the side effect is possible data loss due to loss of operations applied only in memory. Changing the write concern to “journaled” ( j : true) will change this behavior so that MongoDB journals changes before acknowledging them (you also need to be running with journal enabled). TIP: For true durability in a replica set, you should use a write concern of “majority” for operations and the writeConcernMajorityJournalDefault : true on all replica set members (new to v3.4). This has the added benefit of greatly decreasing the chance of rollback after an election. 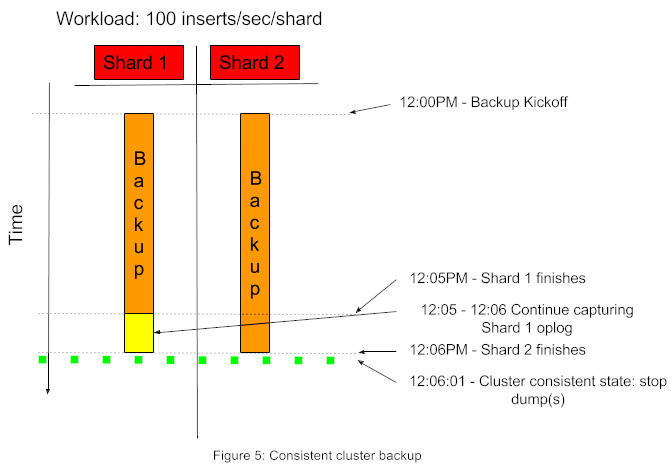 In this example, to get a consistent point in time you’d need to remove all insert, update and delete operations that happened on Shard 2 from the time that Shard 1’s backup completed (6,000 documents). This means examining the timestamp of every operation in the oplog and reversing it’s operation. That’s a very intensive process, and will be unique for every mongodump that’s executed. Furthermore, this is a pretty tricky thing to do. The repeatable and much more efficient method is to have backups that finish in a consistent state, ready to restore when needed. Luckily, Percona has you covered! David Murphy has released his MongoDB Consistent Backup Tool in the Percona Labs github account, and has written a very informative blog post about it. My goal with these blog posts is to make it even easier to understand the problem and how to solve it. We’ve already had an exhaustive discussion about the problem on both small and large scales. How about the solution? How much data each shard contains (whether or not it’s balanced). The takeaway here is that you may need to shard so that each shard has a manageable volume of data. This allows you to hit your backup/restore windows more easily. There’s always a “gotcha” just when you think you’ve got your mind around any difficult concept. Of course, this is no different. There is one very critical concept in sharding that we didn’t cover: tracking what data lies on which shard. This is important for routing the workload to the right place, and balancing the data across the shards. In MongoDB, this is completed by the config servers. If you cannot reach (or recover) your config servers, your entire cluster is lost! For obvious reasons, you need to back them up as well. With the Percona Labs MongoDB Consistent Backup Tool, there are actually two modes used to backup config servers: v3.2 and greater, and legacy. The reason is that in v3.2, config servers went from mirrors to a standard replica set. In v3.2 mode, we just treat the config servers like another replica set. They have their own mongodump and oplog tail thread. They get a backup that is consistent to the same point in time as all other shards in the cluster. If you’re on a version of MongoDB prior to v3.2, and you’re interested in an explanation of legacy mode, please refer back to David’s blog post. We’ve examined the problems with getting consistent backups in a running MongoDB environment in this and the previous blog posts. Whether you have a single replica set or a sharded cluster, you should have a much better understanding of what the problems are and how Percona has you covered. If you’re still confused, or you’d just like to ask some additional questions, drop a comment in the section below. Or shoot me a tweet @jontobs, and I’ll make sure to get back to you. We are able to provide fixes but need to have some comments from you, to make sure we are not loosing some overall perspective! We appreciate you reaching out! I’m raising this with our MongoDB team that wrote the tools. In the meantime, can you provide more detail in the github issue (log messages and description of the MongoDB cluster topology)?